While they are known for their scent and ability to track prey themselves, there aren’t many large animals more elusive to researchers than the wolverine. But a new camera trap study is laying the baseline for more accurate definitions of current wolverine habitat at the southern end of their known range. “We’re right on the edge of actually having a breeding population,” said Nichole Bjornlie, a nongame mammal biologist with the Wyoming Game and Fish Department (WGFD) and a member of The Wildlife Society. The research last winter was the pilot year of a three-year study that addresses a conservation objective outlined in the Wyoming State Wildlife Action Plan (SWAP). Moving forward, Montana, Washington state and Idaho will join the study to get a baseline estimate of the overall range and population for wolverines in the western United States. “Wolverines are a species of greatest conservation need in all four of those states,” Bjornlie said. In the latest of our Wild Cam series, we take a look at the photos from the Wyoming end of this study. The study used 18 grid cells spread throughout western Wyoming in areas from the Wind River Mountain Range all the way to the Yellowstone National Park area. “It pretty much extended to the predicted areas of [wolverines’] range,” Bjornlie said. Camera traps took around 70,000 photos and though around 8,000 of these showed wolverines, researchers have only been able to identify three distinct individuals, such as the one hanging out in this shot. Aside from relatively known or predicted ranges, researchers also found evidence of a wolverine, shown here on the right, in a new area — the Gros Ventre Mountain Range. “That was definitely a new sighting for us,” said Bjornlie. This split shot also shows Meghan Riley, a project biologist with the Wolverine Initiative, who was contracted by the WGFD to do some of the research work. The researchers used deer carcasses as bait to bring the wolverines into the range of the camera traps, but they still needed good frontal shots so they could identify different individuals based on their ventral patterns. Unfortunately this shot doesn’t show much of the fur on the animal’s underside. Researchers also used hair snares in order to analyze DNA in future analysis. 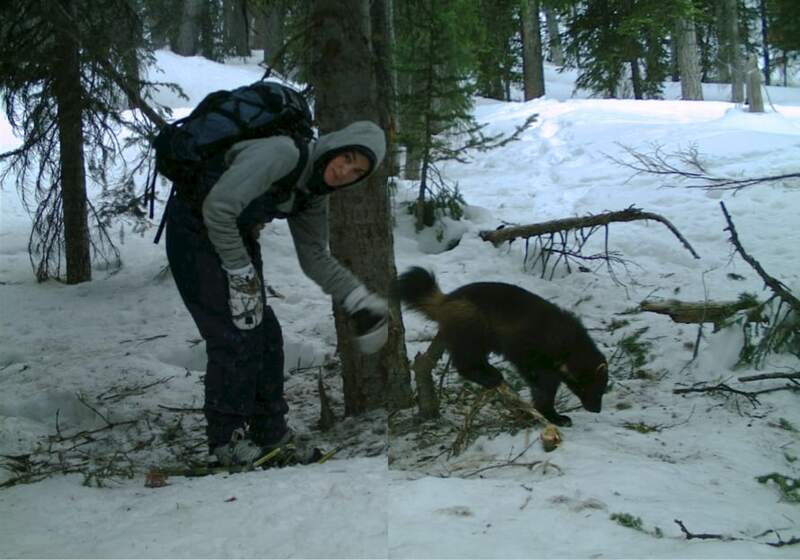 Most of the research was conducted in the winter, when wolverines are more active in their search for food. “We have a better opportunity of picking them up. And we’re not drawing in other predators,” Bjornlie said. There’s also a safety element for the researchers involved. Bears are usually hibernating during the winter, and less likely to hang around the dead carcasses. This shot was taken well into the spring when one popped by the camera trap station for a snack. Wolverines themselves can be fierce of course, as seen in this video of a wolverine going to work on a frozen carcass, shifting the whole body by pulling with its jaws. “They’ve got extremely strong jaws and are quite powerful,” Bjornlie said. Bjornlie said that the researchers wouldn’t normally associate pronghorn (Antilocapra americana), seen in the lower right of the image, with the same kinds of habitats as wolverines. “With all of these camera projects, every day is like Christmas, you never know what you’re going to get a hold of,” she said. The Pacific marten (Martes caurina) is a cousin to the wolverine in the weasel family. Like the wolverines, martens and other Species of Greatest Concern like the northern flying squirrel (Glaucomys sabrinus) mentioned in Wyoming’s SWAP are elusive, and camera traps prove to be some of the best ways to get a glimpse of their population. Some of the carcasses were hung up in the tree at the top of the camera’s range. Bjornlie said this was strategically done so that the focus of the shots would be on potential wolverines, and the cameras wouldn’t waste shots on magpies or other birds that landed on the top of the carcass and picked away at it. Overall, she said that though only three distinct individuals were confirmed from the shots, “the number of photos we’re getting of these guys is pretty heartening.” This winter they will expand their pilot year’s work with 20 more grid cells in the state, and will put out another 20 the following winter.